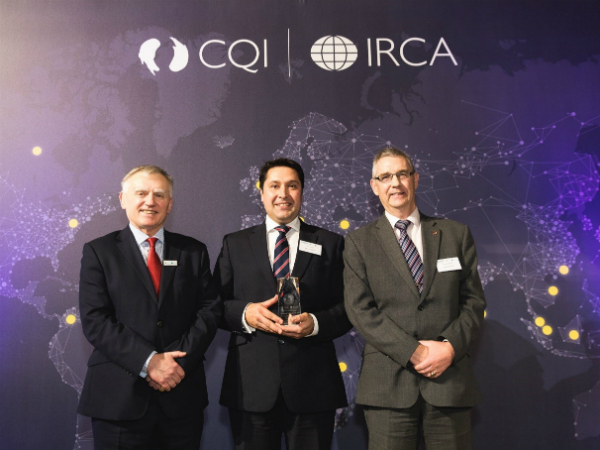 Jaguar Land Rover scooped the Leadership Award at the 2017 International Quality Awards hosted by the Chartered Quality Institute (CQI). The awards are designed to recognise the work of quality professionals who contribute most to their organisation. John Holland, Head of The Jaguar Land Rover Way and Elena Allen, Programme Manager, were recognised for their leadership in establishing our corporate global Integrated Management System - The Jaguar Land Rover Way. Accepting this honour John described the events of four years ago, when he and Elena proposed to bring together and organise our way of working, leading to a modern more intelligent business. In the years since, The JLR Way has grown into a comprehensive platform used by every area of our business. The JLR Way enables all of us to finish each working day knowing we leave our company that bit better. Lessons can now actually be learned; updates to our way make us smarter, faster and more agile. Our people are the key driving force to our success. The JLR Way is leading the mechanism by which performance transformation is enabled. Not just changing processes, but addressing areas of ownership and accountability. Also, providing the means for every member of our workforce to participate and contribute to needed improvement. John Holland said: “The programme team and our valued partners, Sysdoc, have been inspiring in this venture - it is incredibly rare to use the word "flawless" when looking back at what has been delivered and the professionalism as to how the team achieved it. Our credibility in driving this programme is only possible with a support team which never miss a commitment or promise”. John and Elena would like to thank their team, programme sponsors, champions, The JLR Way Council and the huge network of all Process Owners, Operators and the Operational Administrators across the entire company globally who support the programme. The JLR Way is being upgraded with a new technology platform and hundreds of improvements designed to increase capabilities and enhance user experience. TEAMTALK APPVENT CALENDAR WINDOW #8 of 12!